Poor Communication: information is exchanged across disparate channels, leading to a lack of visibility, control, and misunderstandings. Clunky Processes: two or more systems used for the one job. Re-keying data, increasing the potential for error. Low-level tasks performed manually because of a lack of automation. Data in silos: time burned extracting and reconciling information. Reporting and analytics are a burden. No single source of truth, resulting in limited insights and a lack of trust in the data. Constrained to certain devices: for example, legacy systems can’t be accessed via mobiles as they’re incompatible or present security risks. Users have fixed desktops which inhibit efficiency because they can’t take them to meetings. Lack of cross-platform services: disconnected processes and systems. No common data model or APIs to enable different data sources to be leveraged in one place. Crammed office space: flexible, remote working options are limited. The consequences of overcrowding include distracted workers, frayed nerves and low morale. No self-service for basic IT needs: your users and IT team are spending time on trivial support issues, such as password resets. Shadow IT: the unapproved use of apps and other software can compromise your security and compliance. Dated service offerings: your technology isn't scalable, nor it is keeping pace with the requirements of your user- base or customers. Inflexible contracts and software licences: your vendors are too slow or unwilling to adapt to your evolving needs. A frustrated user-base: because your people aren't equipped with the tools to do their best job. A beleaguered IT department: your IT team is devoting most of its time to putting out fires and keeping the lights on, rather than adding value. The Microsoft Modern Workplace gives you what you need to improve productivity, collaboration and employee engagement. Nearly 20% of people live with a disability. We believe that no workplace is truly modern until it’s accessible and inclusive to all: Empower Every Person: Accessibility and Inclusion. Late in 2018, the Greater Manchester Chamber of Commerce invited business leaders representing five sectors to a roundtable event. They shared what the modern workplace means to them. Read what they said here: What do your peers think about the modern workplace? Microsoft 365 technologies empower your workforce. Equip them well and you’ll give your business a competitive advantage. By some estimates, change is happening ten times faster and at 300 times the scale of the First Industrial Revolution. This change is so momentous, it’s called the Fourth Industrial Revolution. The only thing you can be sure of is that the pace of change will accelerate. As a business leader, it’s imperative you’re equipped to respond. And many of you are already responding. The International Data Corporation found that that two-thirds of Forbes Global 2000 CEOs have digital transformation at the heart of their corporate strategy. Learn more in our blog here. For many of us, legacy systems and traditional working practices aren’t perfect, but at least they’re familiar. And you can draw comfort from the knowledge that even the tech Gods at Microsoft have grappled with the challenges of digital transformation. Watch Paul Bolt - Microsoft's Chief Marketing Officer - talk about how Microsoft isn't immune to disruption. A Harvard Business Review found that 78% of senior executives in enterprise businesses believe fostering a modern workplace strategy is essential. However, only 31% think their company is forward-looking enough to do so. Whether you boldly go willingly or not, the inescapable fact is that the workplace is changing, along with everyone's expectations of it. A change in the workplace demands a shift in culture. And culture begins with people: you, your team, and your (hopefully forward-looking) stakeholders. Make it happen: How to Drive Drive Change in Your Workplace Culture. 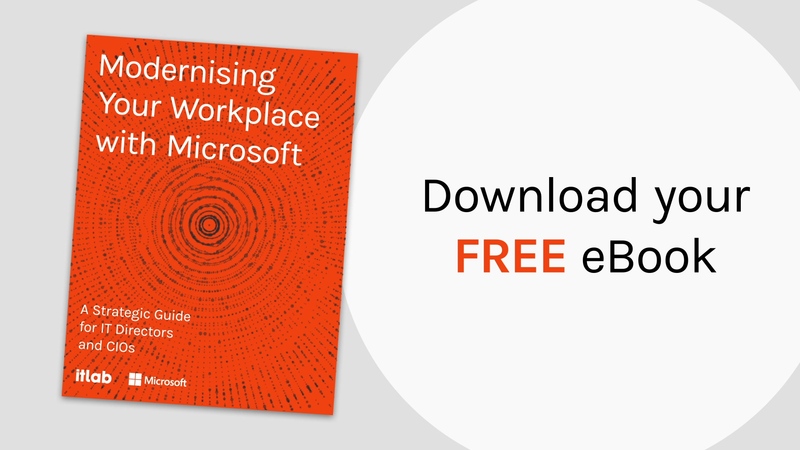 What are the Core Technical Elements of Microsoft's Modern Workplace? The Microsoft Modern Workplace is your integrated, frictionless ecosystem. It's intuitive for your user-base, and agile and scalable for your business. Spin up new locations in days and add new users in minutes. A security wraparound gives peace of mind. As everything is in the cloud, updates are automatic. Watch the webinar here: an Introduction to Microsoft 365 and hear from experts with decades of experience of Microsoft and its evolving portfolio of solutions. If you look for statistics linking collaboration with performance, you’ll probably encounter Frost & Sullivan’s Collaboration Performance Index. The index was the result of analysis of 4,500 enterprises in seven industries and 10 countries. Frost & Sullivan’s research proved that companies that collaborate better perform better. Organisations that equip their employees with effective collaboration tools are more successful in key revenue-generating areas. For project management, Microsoft Teams is the ideal collaboration tool. It’s a hub for bringing people together, both inside and outside your organisation. Users access everything they need – such as files and apps, in a controlled and structured way. Conversations and meetings take place without people having to leave the hub, and teammates can see what’s happening. For non-project work, Yammer is a great tool for connecting people across your organisation and building a sense of community. For deeper advice and links to further reading, catch our blog here. Our blog includes advice on how to get colleagues on board when you have a new idea or concept you’d like to present to them. Capturing the actions from endless meetings and juggling the resulting to-do lists can be overwhelming. Microsoft has a neat tool to manage this, called OneNote. It’s your digital canvas for making notes and annotating documents with the natural feel of pen and paper. You can also capture the information on whiteboards. Enjoy the comfort of having your meeting records and notes in one place, combined with a powerful search facility so you’ll never have to hunt for anything again. For deeper, technical information on OneNote, check out ‘How to keep pace in a world of information overload’ in our blog here. How do you rapidly find what you need from a database containing thousands or even millions of files? When you want to identify an expert to help with a project – either inside or outside your business, how do you locate them? The answer is to use Microsoft’s intelligent search and discovery, which is powered by artificial intelligence. By storing your files on SharePoint or OneDrive, you can search in the same way as you do on the internet. File management tools identify text in images, so you can quickly locate screenshots, receipts and whiteboards. Once you’ve found what you need, you can import it to Outlook, PowerPoint, Word or Excel. LinkedIn Profiles are integrated with M365 so the people you need are only a few clicks away. For more details and access to Microsoft resources, catch 'How to find the information or experts you need without burning time' in our blog here. The reality for many mobile workers is that they play catch up on their return to their office. Their access to files and systems is blocked or limited, and collaboration is impeded. Nearly 50% of professionals believe their mobile devices are core to their productivity. For those who spend a lot of time travelling, accessing business applications and maintaining effective communication with HQ is even more important. Microsoft puts the workplace in the pockets of your mobile workforce. Microsoft Teams, SharePoint, OneDrive, and your company intranet will help them stay fully connected and productive. Common applications like Excel, PowerPoint, Word and Outlook are compatible with popular mobile platforms, like iOS and Android. Cortana – a personal digital assistant – further enhances the mobile experience. For more advice, catch our blog, challenge no. 5. "Security weaves seamlessly through every element of Microsoft 365. Microsoft safeguards your data, devices, apps and users. As the technology is in the cloud, it’s continuously and automatically updated." Ineffective, poorly managed meetings are bad for business. A survey of nearly 500 business leaders found that 90% of them attributed a lack of advanced planning and organisation as the main failure of most meetings. (Source: software company Atlassian). Meetings that meander on with no clear purpose. Underprepared colleagues. If information was shared ahead of the meeting, they either missed it or didn’t read it. A lack of clarity – responsibilities and timelines aren’t captured, actions not followed through. As well as being an expensive waste of time, such meetings crush morale. With Microsoft Teams meeting functionality, collaboration starts the minute the meeting is scheduled. Attendees share documents and connect on ‘persistent chat’. Rich audio and video capabilities enhance the user experience. The wider task and project management capabilities in Microsoft Teams ensure everyone stays on track. See our blog for further details and resources. In big organisations, especially those with multiple sites, employees can feel disconnected from head office and each other. If people feel excluded from decisions that affect them, or have no voice, their commitment may erode. This can manifest in different ways: low productivity and energy, lack of initiative, absenteeism. Furthermore, when workers feel left out of the loop – especially during times of uncertainty or change – it can set the rumour mill spinning. Yammer is a social network for business. Yammer helps foster a community and breaks down people silos. You can set up Yammer groups to manage comms on a specific topic. Find resources and learn more in ‘How to help everyone in your company feel like they belong’ in our blog. When employees are overloaded, the chances of them eagerly devouring every word of your company newsletter or important announcement are thin. However carefully you’ve crafted your communication, it’s competing with a great many other things going on in their heads. Did you know that the brain processes video 60,000 times faster than text? Microsoft Stream makes video communications easy. For scattered teams and remote workers, it comes into its own. You can also integrate Microsoft Stream with other collaborative apps, such as Yammer and Teams. Read more in ‘How to make your employee communications more engaging’ here in our blog. Despite the proliferation of other channels of communication, email remains the number one choice of many. While people are often guilty of copying co-workers unnecessarily, there’s a deeper challenge. Setting aside the merits of Teams and SharePoint, how do you bring new team members up to speed on older emails? You can add them to a distribution list when they join, but that won’t solve the problem. Groups in Outlook allows you to modernise your legacy distribution lists. New team members can view past emails. You can also use an Outlook Group to invite everyone to a meeting at once. Learn more in ‘How to ensure the right information is shared with the right people’ here in our blog. Your business generates high volumes of data every data, but what value are you drawing from it? Despite the mantra that data is the new oil, less than half a per cent of digital information is used to inform decision making and improve performance. Why is this? Valuable information often languishes in disparate systems. It takes time to extract, reconcile and analyse it. By the time the job’s done, it’s out of date. Microsoft 365 helps you make data-driven decisions in real-time. We introduce the tools to achieve this – including Microsoft Business Analytics and Power BI, in ‘How to get more value from your data’ in our blog. Ensuring everyone is aligned with your business goals can be challenging. Are they spending time on what counts or are they vanishing down rabbit holes? Are inefficiencies or obstacles getting in their way? Give your workforce visibility of how their actions are contributing to your company’s ambitions with real-time dashboards and KPIs. Not only does this foster a shared sense of purpose, it enables your management to better track performance and other important metrics. For details on getting started with dashboards and the value of Power BI, read ‘How to keep everyone on the same page’ in our blog. "Fundamentally, the Modern Workplace is about technology that just works. At IT Lab, this means placing users at the heart of decision making. The premise is straightforward; businesses thrive when people are equipped to do their best job." In our personal lives, much of what we do is measured. From what we eat, to the exercise we take and our sleep patterns. Our personal apps give us an opportunity to be better versions of ourselves. So, why don’t we enjoy the same insights at work? With MyAnalytics, you can. Microsoft found that MyAnalytics users commonly save half a day a week through building better working habits. Workplace Analytics gives a holistic view by aggregating and anonymising the data from MyAnalytics. See productivity trends and work patterns across your organisation. Use them to identify blockers and inform improvements. Workplace Analytics is also valuable for measuring the impact of change. For more information on MyAnalytics and Workplace Analytics, check out ‘How to be productive in a world of distractions’ and ‘How to see the big picture and identify what matters’ here in our blog. Over 40% of businesses and nearly 20% of charities experienced a cybersecurity breach or attack in the last 12 months. (Source: Department for Digital, Culture, Media & Sport – Cyber Security Breaches Survey 2018). The average cost of a data breach is rising, at over £3K for businesses and £1K for charities. But cybercrime shouldn’t be measured solely on the numbers. Reputations built over years are destroyed in days. Operational downtime is crippling for your employees and your customers or service users. There’s the emotional impact too; a cyber attack is blindsiding. The dangers aren’t just on the outside. Insider threats – careless or malicious employees - cost British business millions. As if this isn’t enough to worry about, the longer a breach goes undetected, the costlier it is to fix. Many organisations are nervous about entrusting all of their data to the cloud, choosing instead to manage sensitive information on-premise. Ironically, this often means it is less secure. Legacy and on-premise systems also present a barrier to innovation. Security is the thread that runs through the Microsoft ecosystem. Achieving the same level of threat protection in-house that Microsoft delivers as standard would be prohibitively expensive, making a compelling argument for a wholesale move to the cloud. For an overview of the security benefits of Microsoft 365, check out ‘how to maintain security while embracing new technologies here in our blog. How close or far are you to the modern workplace ideal? Complete our free online assessment to find out and begin plotting your journey. If you could eliminate your top three business headaches, what would they be? To respond with greater agility to the needs of your C-Suite? Like many organisations – perhaps security is a huge concern. Or maybe operational and people silos are holding your business back. Whatever your needs, it’s likely that the functional element of your role means your time to strategise and transform is limited. As the UK’s most awarded Microsoft Certified Partner we can help you navigate your choices and design your modern workplace. From short-term consultancy to a long-term partnership, we support businesses like yours every day. We understand your challenges and know how to reduce your time to value. Our consultants and technical experts work as one team and act as an extension of yours. Often, eyes from outside the business will spot obstacles or opportunities your people have become blind to. The Microsoft Modern Workplace is your door to digital transformation. At IT Lab, we give you the keys to unlock it. Often, the challenge is knowing where best to start. Your infrastructure is complex, having grown over many years. Knowing what and where to focus on first can be overwhelming. The goals of your business must be met and your user-base should be equipped to deliver those goals. Our Microsoft Modern Workplace Audit gives us an intimate understanding of your needs, pains and ambitions. We’ll engage with your users as well as your C-Suite to give us a complete picture of your business. The resulting gap analysis will include our strategic and technical recommendations: your roadmap to the modern workplace. For more information, click here or the button below. At IT Lab, we have the skills and experience to deliver and manage your modern workplace. Teams covering three disciplines: Microsoft 365, Cybersecurity and Business Performance will work with you to achieve your ambitions. We’ll design your digital transformation in a way that’s sympathetic with your needs, goals and pain points. We’ll work with you every step of the way: collaborating, reviewing milestones, keeping you updated. And once you’ve achieved the Modern Workplace ideal, we’ll work with you to optimise it, ensuring your ecosystem evolves in step with your business. For more details on our thoughtful and intelligent workplace design, click here or the button below. As the most awarded Microsoft Partner in UK, you can trust that our hands are safe hands. In 2018, we celebrated six gold and two silver Microsoft Competencies placing us in the elite 1% tier of Microsoft Certified Partners. Security is core to everything we do; our 2017 acquisition of Perspective Risk means our cyber team is among the most highly qualified in the world. We’re a member of the Cyber Exchange and our Chief Information Security Officer sits on an influential committee advising government on matters of national security. As you might expect, we’re ISO certified: ISO 9001 (Quality Management Systems), ISO 27001 (Information Security Management System) and ISO 222301 (Business Continuity). We’re ranked by Cloudtango as the number 1 managed service provider in the world and, for six years, feature in the Channel Futures 501 awards as a winning MSP.